As little kids back in the sixties in suburban West Coast Canada, my best buddy and I would spend a lot of our classroom time drawing war scenes on pieces of paper. Our depictions were filled with fun explosions and gunfire. Traditionally, the good guys always defeated the bad guys. That was less than twenty-five years after World War Two, which meant Americans against Nazi Germans. (“Achtung! 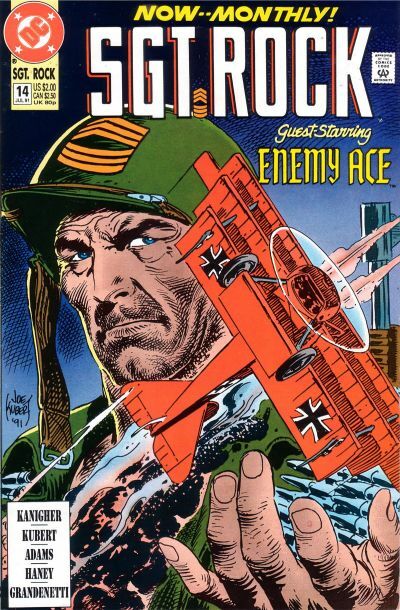 Schweinehund!”) Sargent Rock and Sargent Fury were two of the action comic books that I’d sometimes read under my blankets at home when I was supposed to be sleeping. The world seemed so clearly laid out in black and white, and we were the triumphant heroes. Could I have imagined back then that I would marry and move to Europe decades later, and live a pleasant life in enemy territory? It took a long time for me in Austria (where I arrived in 1986 to marry my sweet Viennese Fräulein … whom I had met in India!) 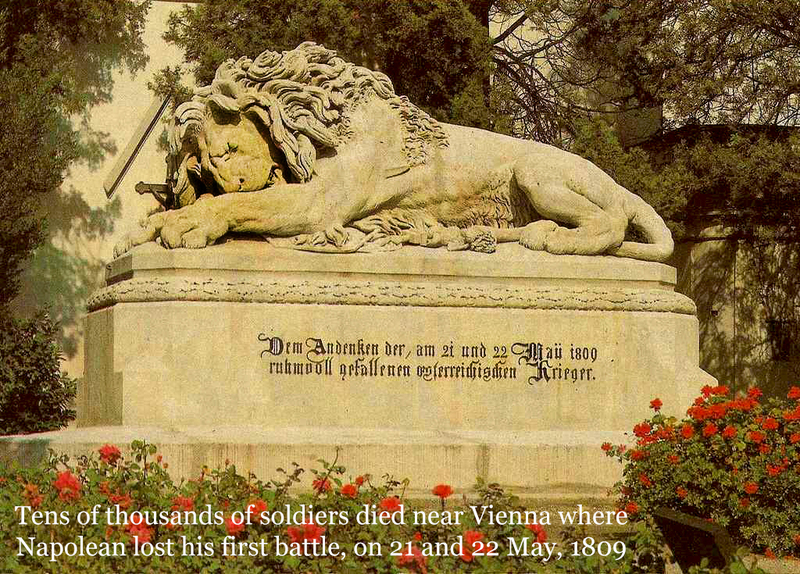 to realize that every war memorial statue and roll of honour here praised the so-called bad guys killed in action. The fact really came home to me one day when I helped fill a scene full of SS officers as an extra in an American Broadcast Corporation television series called War and Remembrance. I was in Vienna’s Rathaus Keller (City Hall cellar) at a make-believe banquet, dressed as a Nazi (they paid me extra to have my blond hair shaven down to a crew cut) with two hundred other scary looking men, and a Hitler look-alike raving up on the podium. (What a jerk!) This was daily life here not long ago, and it’s been equally brutal in many other countries since. 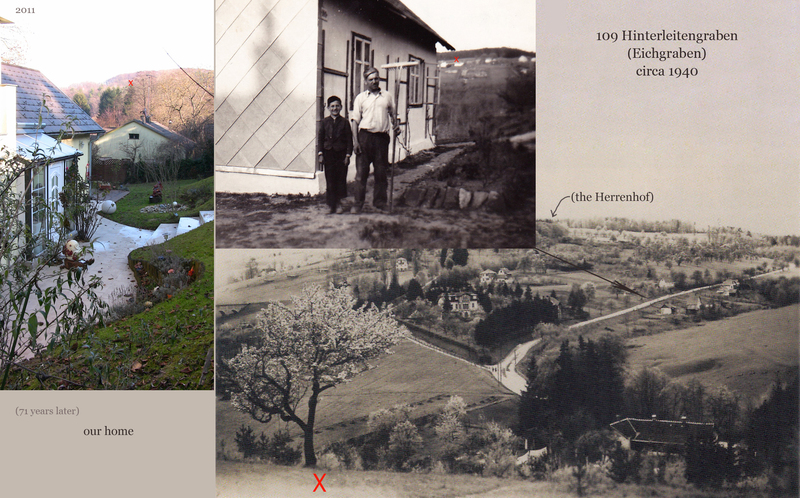 In 1989 I spent a few weeks working in a one-hundred-and-fifty year old family-run shop in the heart of Frankfurt. My boss, like his parents and grandparents before him, did exclusive picture framing work. 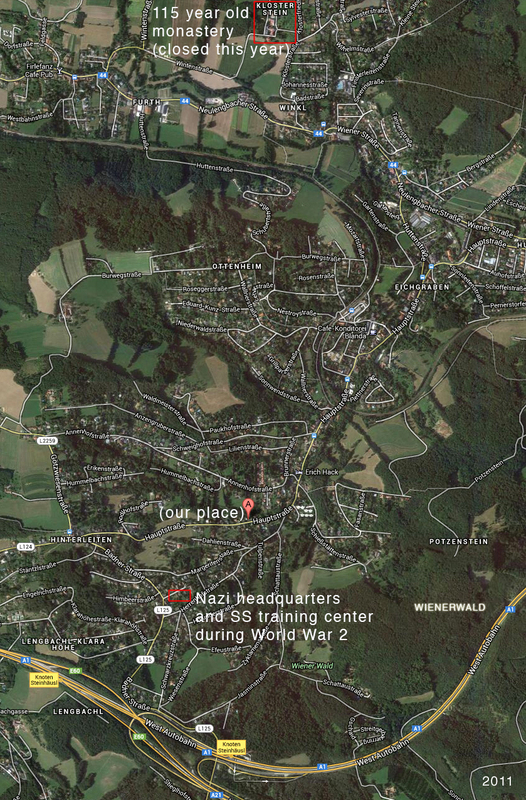 They had also all been Nazi supporters. So many times I had to listen to his assertions that the Allies did worse things than Hitler’s well-meaning assistants. Some evenings on the bus ride home I couldn’t help crying, so intense was the physical pain in my heart from those tangible, torturing vibrations. My father-in-law, a very kind and intelligent, now retired, government official, was spared the fate that met most of the servants of das Dritte Reich. When, as a teenager in 1941, he was drafted and forced to quickly chose between serving as a Luftwaffe gunner or an aircraft warning observer, he was able to choose the safe position. His guardian angel placed him in an observation tower** outside of Paris where he saw no fighting. (His comrade fired some shots towards the ground one night, only to discover the next morning that it had been cows moving around down there in the dark.) 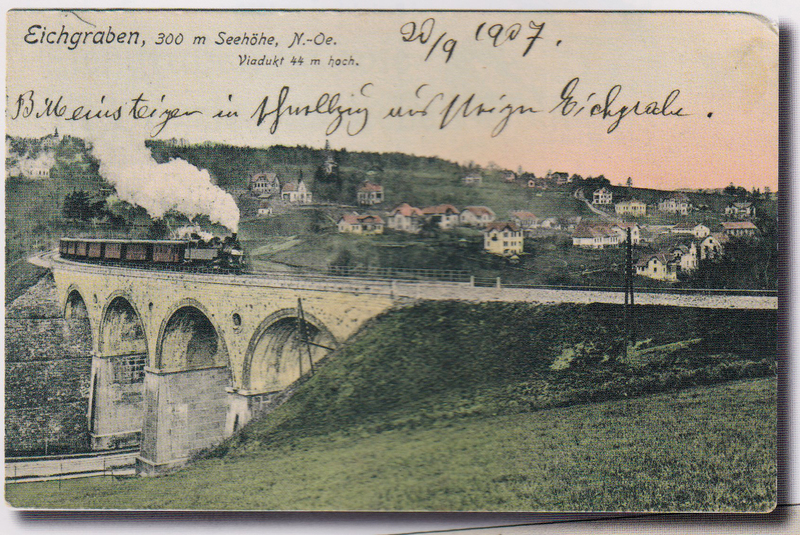 Then, on the way to Hamburg to deliver a package, he put his hand through a train compartment window when their car jerked, and was declared unfit for battle because of a stiff thumb. He still remembers the moaning of wounded soldiers from the Soviet front in that Hamburg military hospital where he lay until his mother, undertaking the long journey from Vienna, rescued him and took him home. 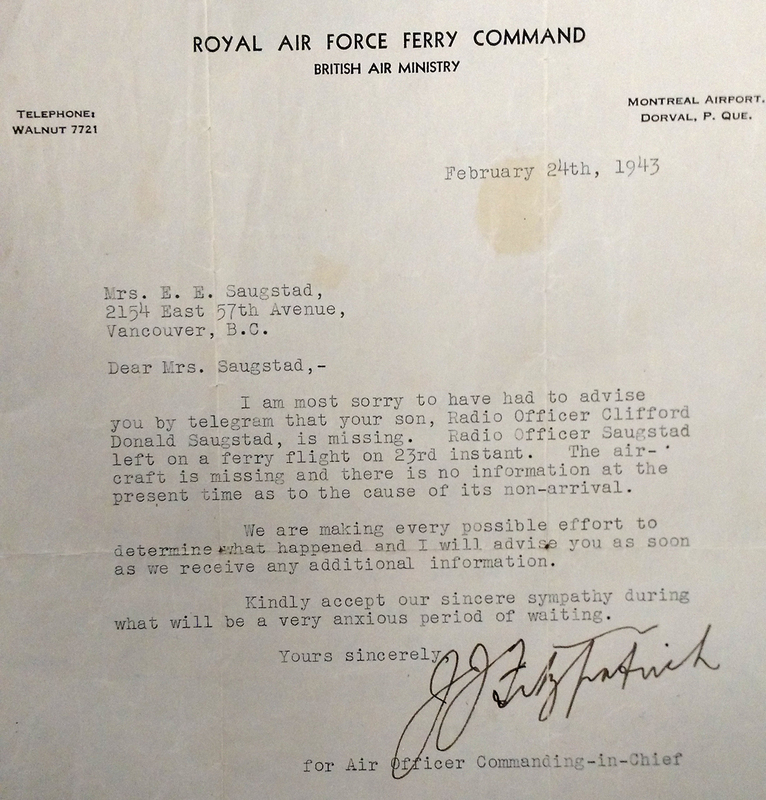 (It was about this time that my Dad lost his brother, Cliff, as the plane carrying him and other young recruits disappeared from the radar screens — see letter below.) She had organized his transfer through an important doctor that she knew. After his convalescence he was allowed to continue his studies, and heard about the end of the war over the radio in a friend’s apartment in Vienna’s fourth district on the eighth day of May, 1945 (where he was staying because the Allied Forces had been carpet bombing his neighbourhood near the main train station — my first home in Europe from 1986 till 1999). If the Germans had developed their radar technology sooner, or if that train hadn’t made a sudden stop, my wife may never had been born, as her father would certainly have been sent to battle and been killed, or died slowly as a prisoner-of-war in Russia, like his father. Papa went on to serve his country for three decades as head of the Regional Land Use Commission, receiving the national Decoration of Honour in recognition of his outstanding integrity and dedication, from the Chancellor, when he retired in 1987. We might not experience all-encompassing war in Europe again*** (if the Western neocons don’t provoke Russia into further defensive measures) but a similar firestorm is brewing in Asia and the Middle East as I write these words. May mankind soon choose enlightenment and benevolence over baser motivations. Surely we have been deeply prepared for that higher destiny. This entry was posted in 2017!, courage, forgiveness, freedom, friendship, hope, humanity, life, peace and tagged Austria, Eichgraben, peace, Saugstad, Vienna, war. Bookmark the permalink. I feel honored to have heard some of those tales first hand during our visit there..
Wow Ed. This isn’t just a history lesson, it’s beyond. How small things can change so much in a moment. Most certainly, let us all hold that energy which is moving , pulling, enveloping us All to a higher consciousness. Thanks for sharing.